Casual Match will be a beginner-friendly mode that de-emphasizes ratings and rankings in favour of fun and interesting games aimed at newer players or those wanting a more chilled-out Prismata experience. Matchmaking based on level, ranked tier, and other factors aimed at pairing newer players up with each other. Smart unit selection so that newer players are exposed to more units as they unlock more blueprints. A consolidated and simplified list of modes (perhaps featuring an event-of-the-day or something of that nature, still TBD). A variety of bot personalities available as optional opponents. We’ll be releasing more info on Casual Match closer to its launch, but for our purposes today, it suffices to know the following: Casual Match will be designed to meet the needs of all newer Prismata players and those looking for a less serious game. Accordingly, we’ll be able to focus on making Ranked Play offer one single thing: the most competitive Prismata experience possible. Prismata was, from the ground up, designed to be the ultimate competitive 1v1 strategy game. In this manner, it actually stands out among multiplayer titles—the vast majority of major multiplayer games in recent years have shifted away from competitive 1v1 and focused more on team-based and casual modes. There are a number of reasons for this (many of them relating to various unfortunate trends in free-to-play monetization), but regardless, we’re happy to fill the void. We want our Ranked Play mode to be fiercely competitive. End of story. That’s a big part of why balance is so important to us. And with Casual Match satiating the needs of newer players or those wanting a break from competitive Prismata, we’ll be looking to make whatever changes we can to Ranked Play to help balance the game. The big balance patch in February actually got us pretty far in terms of fixing lingering unit imbalances. There aren’t too many individual units that are leading to serious player advantage or large numbers of complaints from the community. However, after fixing the outliers in unit balance, we still feel that there are a few more small things that can be done. 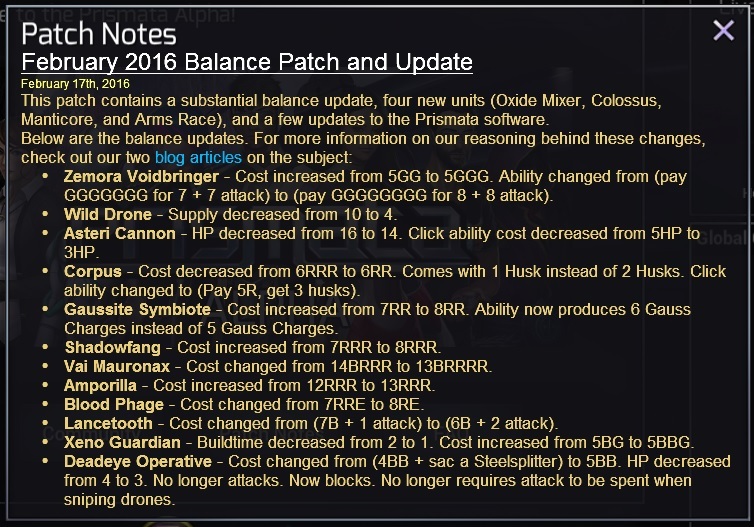 The February 2016 balance patch contained a huge number of influential unit changes. Can Ranked Play balance be improved further? Player 2 still has a small winrate advantage at high ratings—since the last patch in February, the p1/p2/draw statistics are currently at 48.6% / 50.8% / 0.6% in games where both players are rated 1800 or higher. The exact number is much closer to 50/50 at lower ratings, and it tends to shift around a little bit as we make adjustments to individual units, but I don’t ever recall a time when player 1 had more than 49% overall equity. By analyzing thousands of replays, we can observe some trends in when players are winning—for example, a tiny uptick in player 1 winrates in games where players both play DDE on turn 2, or in games where both players buy certain key units like Defense Grid. We often receive complaints about perceived imbalances in openings (e.g. those involving turn 2 Conduit or Animus favouring player 2), or the fact that player 2 effectively gets an extra Drone supply (a maximum of 27 instead of 26 Drones). In some cases, it’s not even really possible to prove or disprove the assertion that these factors lead to genuine balance problems. After all, there’s no way to truly check whether p1 could have won if they had an extra Drone supply. Observational statistics can only tell us so much. Moreover, it’s not even clear that these addressing these imbalances would improve gameplay. One of the benefits of Prismata’s asymmetrical starting positions is that they often lead to tech, econ, and build order diversity. Trying to “flatten out” all the little combinatorial bumps in the opening can reduce this effect, potentially leading to more “mirror games” where both players make the same tech purchases and unit choices. We’ve had a large number of internal discussions (for years, in fact), about what version of Prismata might be the “most ideal” in terms of balance. There was actually a long period of Prismata’s history where Conduit was priced at 5, and there was also quite a bit of experimenting done with a starting position in which both players began the game with 1 gold in the bank. Of course, neither of these changes ended up sticking, but we had no way of knowing whether or not they were beneficial (for two reasons: we didn’t have a large enough community to gather any meaningful statistics to evaluate our success, and Prismata was still full of absurdly imbalanced units so the statistics would have been meaningless anyway.) Lacking any evidence-based reason to favour a 1-gold-in-the-bank starting position over the existing one, we defaulted to the simpler and more elegant option. Possible, but unlikely change to Prismata’s rules: Give player 1 an extra gold on turn 10 (and adjust the value of “10” to be smaller or larger until a 50/50 winrate is achieved). We spent a lot of time in 2014 toying around with the idea of a “pre-game phase” where players could draft units or participate in an auction for choice of whether play first (using time or delayed gold as currency). We discarded the “pre-game” idea for a number of reasons: we didn’t want to interrupt the flow of gameplay too much, and we didn’t want “guessing which side is more favoured” to be a large part of the required Prismata skillset. However, you’ll be seeing a pre-game phase appear in Raids when we start releasing PvE content. More on that in future months. Adjusting Drone supply – MAYBE. We’re not convinced that it would do much to affect win rates or other measurable balance statistics, but we’re open to the idea of giving player 2 one fewer unbought Drone than player 1 (i.e. 19 initial Drones in player 2’s unit supply). Simply improving the perception of Ranked Play fairness is a good enough reason. Expect to see us experiment with it in the Prismata alpha soon. Moving Base + 5 out of ranked? – POSSIBLY. We’ve seen some statistical evidence that games involving larger numbers of Prismata units are more balanced—for example, there are many units that grow less p1-favoured or p2-favoured as the number of second-tab units increases. However, a number of players enjoy base + 5 games, so we’re not too keen on forcing these players into unranked queues. We’ll be asking about this in an upcoming survey. Add Doomed Drone to the base set? – NO. 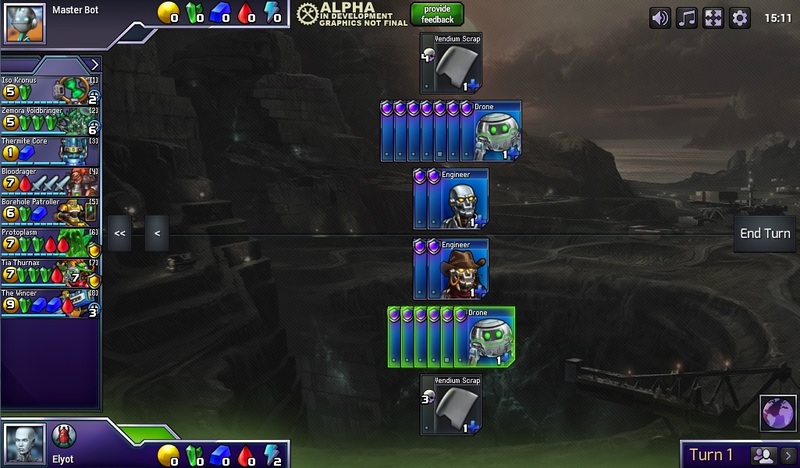 Another frequent suggestion we receive is to add more units to the Prismata base set. A common favourite is Doomed Drone—many players have suggested that the unit’s presence helps to balance openings. We could add it to the base set (it would only involve a small amount of UI rearranging so that a 12th unit would fit in the column of purchasable units), but unfortunately, our statistics tell us that games involving Doomed Drone are no better balance-wise than games without it. Create a completely new purchasable base set unit? – NOT QUITE. We’ve also examined the possibility of adding a completely new unit to the Prismata base set. In fact, in late 2010 and much of 2011, Prismata actually had a third colourless unit in the base set beyond Drone and Engineer. The third unit was called a “Totem” and had various ways of comboing with other units to confer economic benefits. Ancient units from a 2010-era Prismata set in which there were 3 colourless base set units. At the time, we prototyped everything using a tool called Magic Workstation. And Drones were 2E. Totems provided some interesting ways to manipulate resources, but were eventually deemed unnecessary and their functionality was merged into that of Engineer. (There is a long story there… initially Engineer just had a “click, pay 3, construct a Drone” ability, then Energy became a resource, Energy’s role slowly expanded, and Totems were eliminated when Engineers were eventually given the ability to block). Nevertheless, we’ve long wondered if we could introduce a new unit (or click ability on Engineer) that could help smooth out Prismata’s openings. Members of Prismata’s community have even come up with suggestions, and a particular post by Aetherllama received a lot of attention last year. Back then, I mentioned that we’d be reconsidering the idea at a later time after achieving better unit balancing, and now is roughly the time. That said, the idea of adding a 12th purchasable base set unit always seemed like overkill compared to a simple idea like “give player 1 an extra gold on turn 10”. We spent a lot of time looking for something in between. Change the initial starting position in Ranked 1v1? – POSSIBLY. The ideas that we spent the most time mulling over were all of the form “what if one or both players started with X“, where X was some kind of alternate Drone, one-time-use trinket, or other bonus. Such ideas have one great benefit—we don’t need to devote an additional slot in the buy box to a new unit. In most cases, they also keep the Prismata gamestate relatively clean. Other games have taken this approach, notably Hearthstone with its coin item. 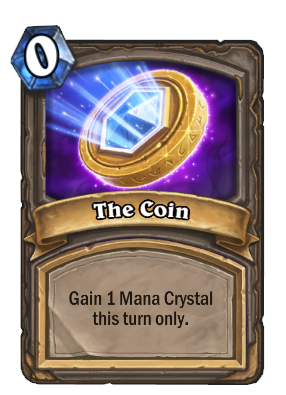 Hearthstone developers addressed player advantage in their game by giving player 2 a “Coin”. Adjusting Prismata’s starting position isn’t out of the question, but we have to tread very carefully. We don’t want to completely disrupt existing Prismata openings, introduce new problems, or overcompensate for existing balance issues (which are actually much smaller in magnitude than those that prompted Hearthstone developers to create the Coin). The status quo is already quite good—comparing Prismata’s balance to the 55/45 bottom vs top winrate among top teams in season 4 of League of Legends, it feels like simply doing nothing is a totally viable option. After mulling over the idea for a while, we resolved to give it a shot. The plan: create a supplementary unit whose presence would result in a gentle adjustment in some of the situations where balance improvements felt possible. If we could find something promising, we’d show it to the community. If it was met with approval, we’d try it in Ranked Play on the Prismata alpha server. If the community liked it and the statistics showed favourable changes in balance, we’d consider keeping it. Dozens of ideas presented themselves, and we spent a lot of time doing playtesting, theorycrafting, and consulting top Prismata players. Fortunately, we succeeded in step 1: finding something promising. Coming soon to the Prismata alpha ladder for a trial run…? Maybe. If you’ve participated in the last few Prismata events, you’ll recognize the Vendium Scrap (we were testing it out!) The proposal we’re now considering is whether it (or a variation thereof) should be added to every match in Prismata’s Ranked Play mode. Permanently. The lifespan value of the initial Vendium Scrap is still up for debate, as are a few other attributes. At first, Vendium Scrap looks terrible. Unclickable. Impossibly weak. Indeed, the ability is pretty lousy in the vast majority of situations (2 gold is almost always worth more than a Drone that doesn’t arrive for 3 turns). However, in situations where you would otherwise be storing that 2 gold in the bank for a few turns, Vendium Scrap can sometimes generate a small amount of value. 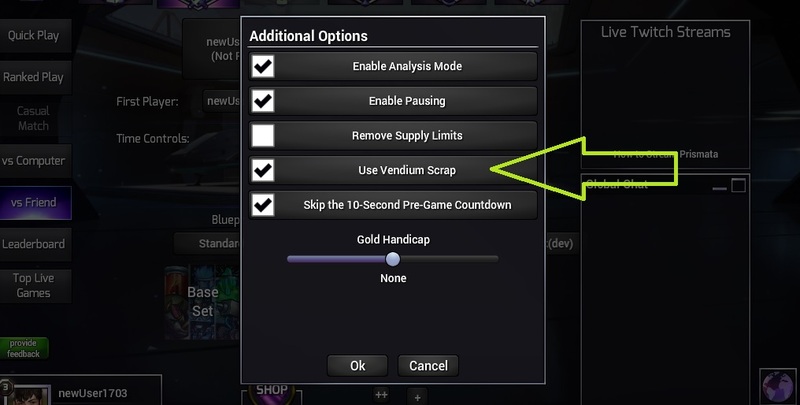 Accordingly, if you’re playing with Vendium Scrap and want a genuinely good rule of thumb concerning when to click it, just do the following: click it if and only if you would otherwise be leaving 2 or more unspent gold in the bank with no good plan to use it next turn. The unit provides player 1 with a weak-but-sometimes-playable option of opening DD/DDV, which can be useful with DDC or AC follow-ups in situations where player 2 has a strong DD/DDC opening, but DD/DC or DD/CC are not playable for player 1. The unit provides player 2 with a weak-but-sometimes-playable DD/DDEV opening that strengthens player 2’s position in high-econ games where Conduits are weak. Of course, it’s not a silver bullet for every Prismata balance problem. But it takes aim at the most egregious issues that we often receive complaints about, and felt great in test games. The fact that we’re even considering adding it to Ranked Play is a testament to how well it actually works. Vendium can now be used in private games! The bots haven’t yet been taught how to use the unit, so don’t be surprised if they do a few silly things with it. It’s mostly just there for testing openings and experimenting. As for Ranked Play, we’re looking forward to conducting an experiment involving Vendium Scrap next week. More info to follow. Should Vendium be clickable on turn 1? We could give the Scrap a turn of buildtime if, e.g. we see an undesirable uptick in p2 winrates in games involving Wild Drone when Vendium Scrap is added. Should Vendium be clickable multiple times? This is available as a potential balancing knob, as testing revealed a number of p2 openings in which it might be desirable to use Vendium Scrap on both turns 2 and 3. Should DD/DDEV/DDDV be allowed? We’ll be looking to the stats for an answer to this one. What about other variations? We also considered a Vendium Scrap that gave 4 gold instead of a Drone, or gave 3 gold in 2 turns instead of a Drone in 3 turns (which is quite close to what Aetherllama suggested last year). We’re happiest with the Drone version for now, but we could change our mind. 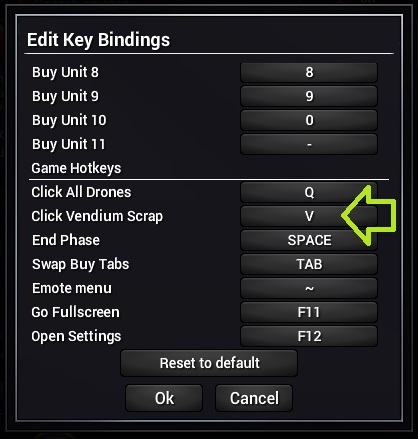 One more thing: the name “Vendium Scrap” is not necessarily final; in particular, we’ll likely change the unit’s name and flavour if it becomes clickable multiple times. But that’s where we’re at for now. Apologies for the long article; it turns out that there was a lot to cover, which is why this article ended up being split into two parts. This is a big decision for us, so I really want to give a solid explanation of our motivations to help bring the community on board with our thought process. We’ll be soliciting a ton of feedback. On that note, I must go for now, lest blogging consume all my work hours. More blogs/vlogs and a few buff/nerf announcements coming in the next couple of days.